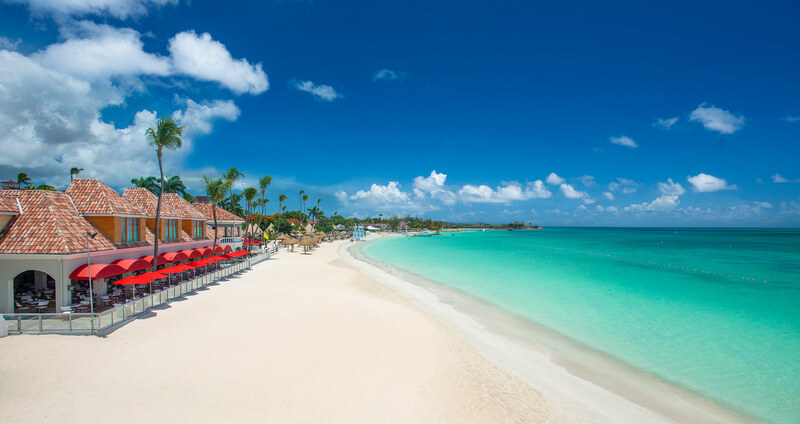 Voted the "World's Most Romantic Resort" year after year, Sandals Grande Antigua is located on Antigua's best and most famous beach, Dickenson Bay. Explore the Caribbean Beachfront Village, a charming seaside garden oasis graced by meandering pathways, majestic palms and cooling Trade winds. Then step into a realm of chic sophistication where European grandeur unfolds from the hillside to villas-by-the-sea at the Six-Star, all-suite Mediterranean Oceanview Village. Come relax on silky-soft, pure white sands and let the warmth of the Caribbean fill your senses. Create your own lover's legend as you share the most romantic holiday of a lifetime. Two perfect worlds. One grand resort. All included. Surround yourself in modern luxury with Sandals Grande Antigua's unique Rondovals, tucked into hidden gardens, featuring a private plunge pool. Or enjoy a taste of Mediterranean sophistication with Plunge Pool Villas that border the beach and pool–front piazza. In stunning settings that are on-the-beach casual or white-gloved chic, Sandals Grande Antigua has your mood-of-the-moment covered. With six freshwater pools, including the 15,000–sq.–ft. Mediterranean Pool, and six whirlpools, Sandals Grande Antigua is an aquatic paradise by the sea. Plus, guests can enjoy two of Sandals signature Swim–up Pool Bars. Staying connected with loved ones is easier than ever at Sandals Resorts. Enjoy FREE INTERNET ACCESS throughout your vacation from any device, anywhere on the resort including all rooms. The best way to experience the real Antigua is to get up close and personal with it. Island Routes offers luxury adventure tours that range from completely exhilarating to delightfully sedate. No matter what your speed, you'll gain insider insights and a whole new perspective on this beautiful paradise that we call home. 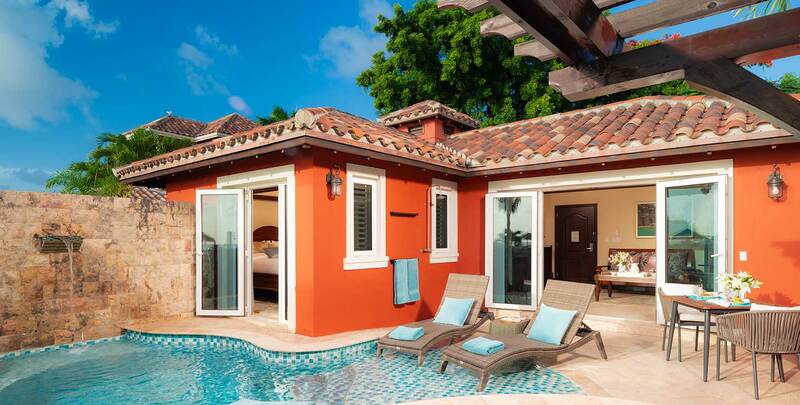 At Sandals Grande Antigua, you can surround yourself in modern luxury in the unique Rondoval suites or enjoy a taste of the Mediterranean in the magnificent Plunge Pool Villas. At eleven world-class restaurants, a global team of master chefs caters to your endless culinary cravings. Whether you like it spicy, tangy, zesty or sweet...in stunning settings that are on-the-beach casual or white-gloved chic, Sandals Grande Antigua has your mood-of-the-moment covered. The Mediterranean Oceanview Village exemplifies tropical colonial elegance, reflecting the refined qualities of Europe’s Mediterranean Coast. An equally stunning locale, Caribbean Beachfront Village is a seaside garden oasis perfect for nature lovers. To take full advantage of the island's sultry, tropical landscape. With six freshwater pools, including the 15,000–sq.–ft. Mediterranean Pool, the largest in the Eastern Caribbean, and six whirlpools, Sandals Grande Antigua is an aquatic paradise by the sea. For inclusive offers, the $635, $525, $405 & $275 Instant Credits are in USD, applied to the base fare and excludes government taxes and fees, which must be paid at time of booking and is fully non-refundable. Book at this specific resort and receive an automatic additional 7% off by Apr. 30, 2019. Booking window: Apr. 24 - 30, 2019. Offer valid for bookings made Apr. 24 - 30, 2019.